I have to admit part of the reason I bought this was the similarity of the character’s name with one of mine. The book, however, struck a deep chord with me. It was a candid snapshot of what it was like to be a woman constrained in the historical ways we’ve generally been limited – by others’ perceptions, by social expectations, by the roles we’re allowed access to, and by our acceptance of those constraints. Easy, gal, she cautioned herself. Forgetting the husband to lunch with another man? She snorted at the whimsy, impatient as the cross-highway light held her up. As if Howell were that type. He was only interested in her work and that part of herself was completely divorced from her family or her marriage, for all the overlapping. It was the as yet unhampered, unpossessed soul of her that she had refused to relinquish to Steve’s possessiveness. She had told him, early in their marriage, that she had given him her body, her worldly possessions, obedience and loyalty: she had given him all her love and devotion but that inner part of her that was unalterably Mary Ellen LeBoyne was not his. By the same token, she did not expect to possess his innermost secrets and soul. She doubted if Steve had any conception of such basic privacy. Very often he acted as if that final reserve were an offense against him, instead of her defense against the world. He was always striving for complete capitulation. It’s considered romance, but I’d say it’s also chick lit, since the way Mirelle navigates through her circumstances brings her face to face with quite a bit of drama and other concerns. It’s a story that doesn’t shy away from the dark underbelly of life and it was startling to consider her perspective as a collegian with optimistic, romantic goggles on about how my life might evolve. In the end, Mirelle’s self-empowerment and the place she carves out for herself in the standard 50s/60s housewife role make her compelling. 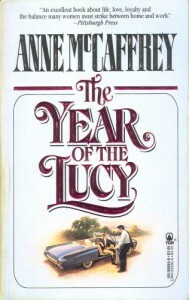 I read the novel in an afternoon, and then eagerly followed up with McCaffrey’s other books in the same cross-over market. Not everything in these worlds comes up roses, and it’s worth revisiting these books for their perspective on how far women have come in just 50 years. I can highly recommend this one (or any of the others, really) to anyone who wants to revisit how hard it was for a female to find her individuality in that context.